Yesterday’s post focused on cool, technologically advanced swim wear for girls from Speedo. So today’s post is going to balance everything out for the boys. In today’s blog post, I’ll go into three separate boy swim trunks. Keep reading to hear about Speedo’s Velocity Splice E-Board trunks, their Marina Volley swim trunks, and the Marina swim trunks in Men’s. All of these boy swim suits are constructed with technological fabric that’s been made to offer more body coverage to give you better protection from the sun. The fabric has a tighter knit, giving you and even higher level of protection. These trunks are made to give you an improved fit so that stretching of the fabric does not lessen their UPF ratings. First on the list are the Velocity Splice E-Board trunks. These trunks are sharp. They’re made with Speedo’s exclusive UV Block the Burn® feature. Velocity swim trunks are lightweight and compact which makes this piece of swim wear quick to dry and easy to travel with—say to the beach and back. They have nineteen inches of Outseam length and side seam pockets made out of 100% Polyester Brushed Microfiber. When you’re in a pair of Velocity Splice E-Board swim trunks, you’re in style. 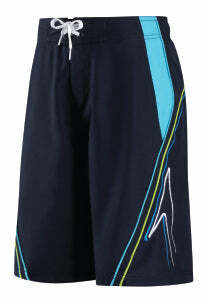 Moving onto the Marina Volley trunks, this pair of swim wear is lightweight as well. These swim trunks have an elastic waistband with a drawstring to pull that will give you a secure fit that’s specific to you. Speedo gives these trunks a side pocket with a Velcro closure that uses a practical water drainage hole. They’re given a fourteen and a half-inch Outseam that spans across the 100% Polyester Brushed Microfiber which is also given UV Block the Burn®. Sport these cool trunks in Navy and Blue, Black and Grey, Navy and Green, or Black and Blue. Lastly, is the Marina swim trunks for Men. Not so different from the Marina Volley, these trunks have a cargo pocket that features a Velcro closure, a water drainage hole, and Speedo’s logo. They have a twenty inch Outseam and a side seam pocket. Made of 100% Polyester Brushed Microfiber, these trunks are your basic volley water short with an elastic waistband and contrast piping. Available in bright Yellow and Black or Navy and Teal—either way, you’ll be in style.